This container includes 2016 monthly issues of the FEMA Children & Disasters Newsletter. The FEMA Children & Disasters Newsletter is a resource for youth preparedness practitioners, educators, parents, children, and teens. It shares timely research, examples of successful youth preparedness programs, safety tips, and resources related to youth preparedness. This container includes 2015 monthly issues of the FEMA Children & Disasters Newsletter. The FEMA Children & Disasters Newsletter is a resource for youth preparedness practitioners, educators, parents, children, and teens. It shares timely research, examples of successful youth preparedness programs, safety tips, and resources related to youth preparedness. 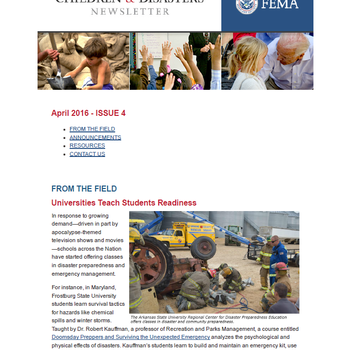 This container includes 2014 monthly issues of the FEMA Children & Disasters Newsletter. The FEMA Children & Disasters Newsletter is a resource for youth preparedness practitioners, educators, parents, children, and teens. It shares timely research, examples of successful youth preparedness programs, safety tips, and resources related to youth preparedness. This container includes the FEMA Children & Disasters Newsletter - December 2013 issue. The FEMA Children & Disasters Newsletter is a resource for youth preparedness practitioners, educators, parents, children, and teens. It shares timely research, examples of successful youth preparedness programs, safety tips, and resources related to youth preparedness. This container includes 2017 monthly issues of the FEMA Children & Disasters Newsletter. The FEMA Children & Disasters Newsletter is a resource for youth preparedness practitioners, educators, parents, children, and teens. It shares timely research, examples of successful youth preparedness programs, safety tips, and resources related to youth preparedness.